All Your New Year’s Resolution in One Place! Note: I rerun this blog post every year on (or around) January 1. I hope you enjoy. 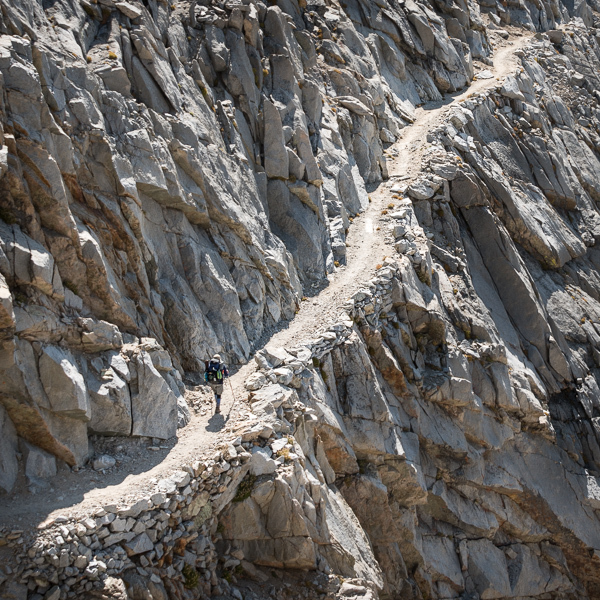 Can You Fall Off the John Muir Trail? The southern side of Forester Pass is the only place where there is significant exposure, and the trail there is especially wide and flat. 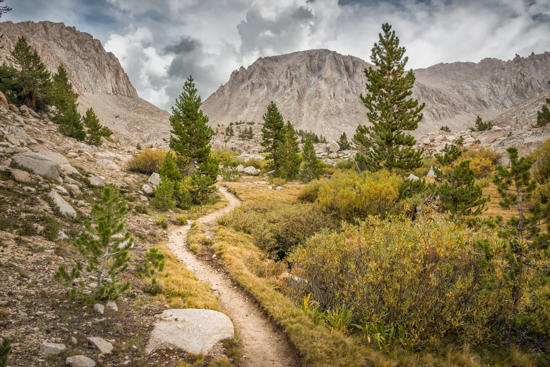 Whenever I am talking to a small group, or even a single hiker, about a potential John Muir Trail hike, I know some of the same questions are going to come up. The bears are often the first concern. Those who are unfamiliar with the Sierra Nevada often are under the impression that they are lurking behind every tree and boulder, and that a substantial part of their diet is backpackers. After that, it’s not unusual to be asked if I carry a gun. Once we have those two out of the way, it’s not long until I start getting questions about exposure to heights – and, more specifically, falls. Just how bad is it out there on the trail? How often do hikers lose their balance, slip, windmill their arms, and tumble into an abyss, never to be seen again? Relax. There is almost nothing to worry about. The only place where you might find yourself getting a little uncomfortable, if heights tend to make you that way, is for about five to ten minutes coming down from Forester Pass (if you are hiking southbound). The trail there is wide and flat, and perhaps more importantly, never crowded. If you suffer from a bit of acrophobia, you can hug the inside of the trail and walk as slowly as you like, without fear of embarrassment. It will be over before the taste of that chocolate bar you ate at the top of the pass has left your mouth. I said there is almost nothing to worry about. Should your plans to thru-hike the JMT include a side trip to the top of Half Dome, all bets are off. If you are even the slightest bit nervous around heights – and who isn’t – getting to the top of Half Dome is going to require that you get well out of your comfort zone. I have never seen a photograph of the climb up the cables that faithfully conveys the feeling one gets looking up that ascent. Furthermore, although fatalities are very rare, they are not unheard of. The good news is that you can arrive at the bottom of Half Dome, decide it isn’t your cup of tea, and still hike 100% of the John Muir Trail. Unlike Forester Pass, Half Dome is optional. Those of you who have been reading the blog for years know that I don’t claim to be an expert on all things backpacking related, but I am a profoundly appreciative connoisseur of one thing: the hour-long, deeply satisfying, self indulgent, trail-side break. There is nothing I enjoy more! ~ A Great Spot. I even go as far as doing a satellite map reconnaissance for places weeks before I hit the trailhead. Here are the key ingredients: a flat area with a view, some shade, some water, a sunny area so I can recharge batteries with my solar panel, and the right distance from my last stop (and my next one). A perfect example is this spot on the way to Donohue Pass. If you needs some ideas, check this out. ~ Re-Hydrate. I carry a bladder, so I do much of my drinking while I’m walking. When I take a break I’ll often break out the drink powder and mix up a Nalgene bottle’s worth of something flavored. This is also how I get my caffeine on the trail, since I don’t drink coffee. ~ A Nap. I’ve experienced some of the best parts of the Sierra Nevada with my eyes closed — just like a lizard on a rock. I even carry the fleece vest I wear around the campsite near the top of my pack so I can use it as a field-expedient pillow. ~ Knock Off Some Chores. Sure, it’s a break, but you do need to get a few things done. I’ll often purify water, slip off my boots and rub my feet (or soak them), make an entry into my journal and write some notes on the map, take some photos, do a navigation and “day’s progress” check, put some layers on or take them off, do some stretching (especially of my Achilles tendons), and check on any nagging injuries, like strains, scrapes or blisters. I’ll also do a map reconnaissance of the way ahead. 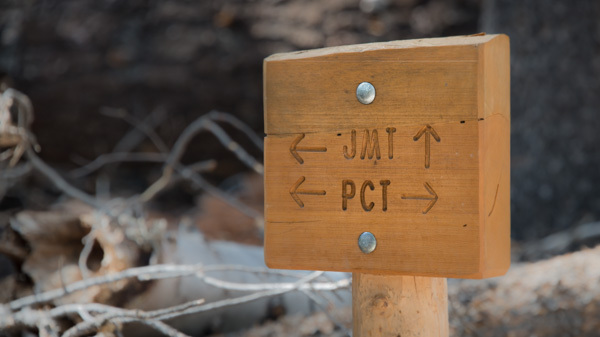 If you are going to thru-hike the JMT you are going to do some goal-setting. There are a certain number of miles you need to cover each day. That said, part of your planning should be to spend at least a little (and if you can afford it, more than a little) time just relaxing and enjoying where you are. There is no better way to do that than with a good break! p.s. One of these is good to have, too! As I approached Guitar Lake it was clear that I was in for some weather. It didn’t disappoint. 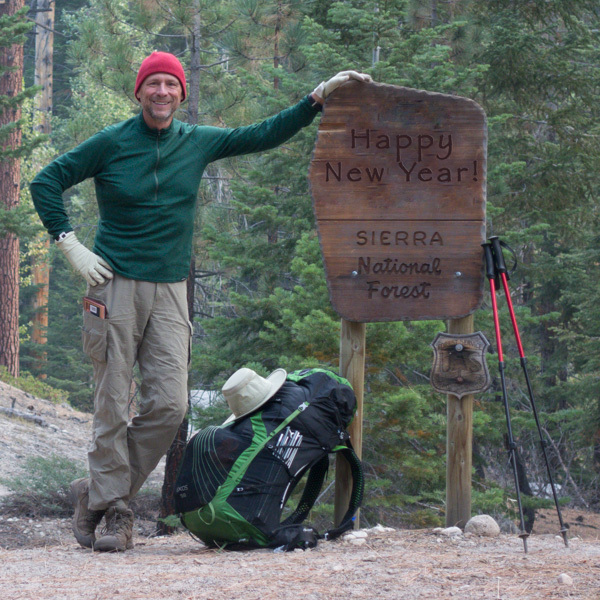 My last night on John Muir Trail in 2013 was a night to remember. That day I had awakened a little later than normal, at my campsite near Wright Creek. I had slept late for a couple of reasons: first, I didn’t have far to go this day. My hike would be less than nine miles to Guitar Lake. Second, the day before had been a difficult one. After climbing the highest of all the passes on the John Muir Trail, the 13,200 foot Forester Pass, I had gotten caught about a third of the way across the Bighorn Plateau when the thunder and lightning began. I didn’t really want to turn back (although that would have been the safest option), so I took a different tactic: I decided I would jog a hundred steps, then walk a hundred steps until I got off the exposed portion of the trail. That approach had been successful, but it had also been stressful and tiring. Also, thanks to a problem with a packer, I was in severe calorie deficit. The hike to Guitar Lake went as planned and I arrived a little after noon. The thunder and lightning of the previous day was gone, but the sky threatened rain. By 12:20 p.m. I had found a suitable site to spend my last night on the trail. By 1:00 p.m. my tent was up, my water topped off, and everything that needed to stay dry was protected. At about 1:20 p.m. I was in my tent when the sky opened up in a big way. It began with heavy rain and wind. My Big Agnes Seedhouse 1 seemed hopelessly fragile and inadequate against the deluge, but, to my delight, not a drop of water intruded. After about of hour of this it was time for the hail. It wasn’t particularly large hail – I’d say larger than a pea but smaller than a marble – but it was coming down hard and there was a lot of it! I started watching the seams of my tent, assuming that if it was going to start coming apart, it would begin there. Again, I was happily surprised. My little tent was providing all the refuge I needed against this raging storm, at an exposed campsite, well over 11,000 feet elevation. By mid-afternoon I was rather enjoying myself. It’s hard to be scared when you’re grinning – this was pretty cool. The storm, with all its fury, was providing nothing more than background music in my snug sanctuary. Time for supper! I eased open the downwind flap of my tent to provide a little ventilation and put together my Jet Boil. I had three things left to eat: two energy bars (for breakfast and lunch the following day) and a complete Mountain House fettuccine alfredo! Soon I was pouring boiling water into the pouch and the aroma of pasta and cheese was filling the small space. Fifteen minutes later I was warm in my sleeping bag, reading my lightweight e-reader, and enjoying a hot meal. There are moments on the trail that are so perfect that they leave memories that endure for as long as one lives. This was one for me. Later, the storm turned quiet as the rain and hail turned to snow, although less than an inch accumulated. I remember the quiet well; it’s funny how a snow falling in a windless landscape deadens all noise. The next day wasn’t clear, but it was dry. I made it to the summit, down the trail to Whitney Portal, and into town. The next night was spent on a mattress, between clean sheets, after a great meal at a Lone Pine restaurant. I’m sure it was far more comfortable, but I don’t remember a thing about it. There’s a lesson there, somewhere. Your first day on the trail can be a psychological challenge. 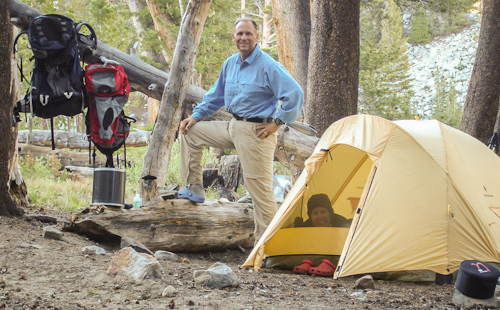 One strategy is to ensure you end that day at a great campsite. This was one of my favorites. You will have planned for this day for as much as a year. (Some hikers will have started even earlier.) You will have agonized over important decisions: tent or tarp, sleeping bag or quilt, boots or trail runners. You will have even spent more than little money on gear, transportation, and accommodations. After all that, you have certain expectations – rightfully so. I believe that hiking the John Muir Trail will meet all of those expectations and exceed them, but it probably won’t on the first day. Especially if you are relatively new to trips of this length (hiking the JMT usually takes at least a couple of weeks and typically closer to three), you need to be ready for what is going to happen between your ears. You need to prepare yourself for the psychology of the first day. I never feel so unprepared for the trail as I do on the ride to the trailhead. I mean, come on: what are the chances that I have everything in my pack I need to be completely off the grid for the next several days. And look at the backpack that other guy has? It is much smaller (which makes him far better prepared), or much bigger (which, oddly enough, also means he is much better prepared). Then I start to develop some phantom leg pains. For me, the best strategy to deal with this part of the trip is to get it over with. As soon as I can after rising that day, I’m on the trail. Do you have a smartphone? Are you constantly checking email, Twitter, InstaGram, and your favorite website for updates? You realize that when you turn off the phone your mind will notice, and probably rebel, right? If I were to compare hiking to any other activity I would probably choose meditation. Without the instantly available distractions served up by social media don’t be surprised if you start feeling something not too far from panic. Relax. It will pass. I’m no Andrew Skurka, but neither am I a novice backpacker. As a member of the U.S. Army Infantry, you could even call me a professional. Regardless, four or five miles into the first day, I almost always become convinced that I have forgotten something. 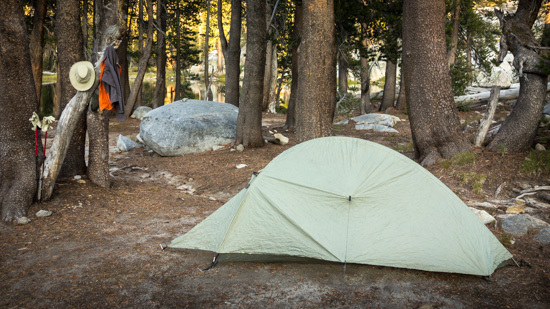 A few years ago, about five miles from the Glacier Point trailhead, it was my tent. On earlier trips it was my sleeping pad or sleeping bag. My routine for packing is pretty foolproof: I first check everything off my list before I put in on the dining room table (with nothing else on the table), and then I check everything off my list AGAIN when I pack it. Using that technique, how could I forget my tent? I can’t, but at my first break I dug it out of my pack to be sure, anyway. Long Day or Short Day? When planning, one question you have to answer is this: are you going to take advantage of your fresh legs and good breakfast and make day one along day, or are you going to ease into this new routine a bit slowly? Physically, I don’t think it makes much of a difference. I do think it can be important psychologically. Here are the two characteristics of a good hike on the first day: set a distance you know you can finish, and pick a campsite that will delight you. Meeting your goal on the first day sets you up for success. Also, make sure you include ample time for breaks and lunch. Nothing will get your head in the woods quicker than munching on some GORP while taking a break next to a babbling brook. When you decide to quit for the day, stop at a place that reminds you of why you are out here. On a recent rip my first day ended at a small lake nearly a quarter mile off the trail. Eating my hot meal that night as I watched the reflected alpenglow fade was one of the high points of the trip, and the first day is a great day to have a high point. It takes a few days on the trail to cast off the worries and anxieties of your life off the trail. Knowing in advance that it is a process that takes some time will make you better prepared. All Your 2018 New Year’s Resolutions in One Place! There are three portions of the John Muir Trail any first-time thru-hiker will inevitably be warned about, often in hushed tones of foreboding. All three are steep sections, and I found that all three were far less difficult than I expected. The hike into the backcountry from Happy Isles. Many folks complain about this first day of the hike, but I always find it to be no big deal. The trail is wide, well-marked, and passes Vernal and Nevada Falls – the largest two waterfalls you’ll see along the trail. If you are stopping at Little Yosemite Valley for the night, it also makes for a short day. Even if you are going past LYV and the trail to Cloud’s Rest, you are still walking fewer than ten miles. True, there are more than 4,500 feet of elevation you’ll need to climb that day, but you do it with fresh legs and a well-fed body. Don’t let this first day scare you and, when it’s over, don’t make the mistake of thinking that every day will be like this. You will be in much better shape before you are required to do this much climbing again. The fifty-plus switchbacks up Bear Ridge. I’ll admit it; I was plenty intimidated by the reputation of this stretch, at least until I hiked it the first time. The key here is to head up early, when the trail is in the shade. Plus, we’re only talking 2,000 feet of elevation gain. When you reach the top, by the way, you’ll find the exertion was well worth it; the next few miles to Rosemarie Meadow are among the best of the whole trail. The climb I found most challenging on the trail was this one, to the top of Mount Whitney. The Golden Staircase. The Golden Staircase itself, while rugged, and certainly an impressive engineering feat, is nothing a fit hiker can’t handle. More significantly, it is only the last part of a 4,000 foot climb from Palisade Creek to Mather Pass, spread across eleven miles. This is going to be a tough day, but by then you’ll be far fitter than you were on day one. Slow and steady will get you to the top every time. Interestingly enough, the one climb on the trail I almost never hear anyone mention, and that I found the most challenging, was the hike to the top of Mount Whitney! 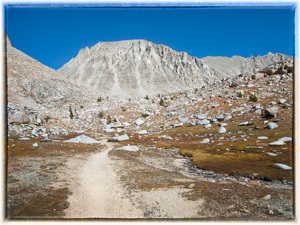 If you start your climb from Guitar Lake you will ascend nearly 3,000 feet in about four miles, all of it in thin air. The difference here, however, is that you have that shower, cheeseburger, and ice cream sundae pulling you towards Lone Pine. After two or three weeks on the trail, that’s a powerful incentive! This represents my (somewhat unconventional) daily hike routine. ~ Sleep falls just below water and just above food on my priority list. Unfortunately, it takes until the fourth night before I am able to fully recharge overnight. I carry a few more ounces than necessary in the form of a thick and durable sleeping pad and I shoot for eight hours, every night. ~ I’ve written about my preference for early starts before. I like getting up before the coldest part of the day (which, all things being equal, occurs AFTER sunrise) and I love being on the move as the wilderness wakes up. If there is little or no moonlight a headlamp is necessary, but I carry one for evenings after dark anyway. ~ If someone were to ask me what my favorite part of thru-hiking the JMT is, I would have to say: the breaks! I often plan them out with great care in order to pick the best spots. I do NOT hurry through them. In fact, lunch usually takes a couple of hours (or slightly more) and includes a nap. Sometimes I’ll take an additional break in the morning for thirty minutes or so. ~ One of the benefits of starting early is that I don’t have to hike late. By around 5 pm I am looking for a campsite. Occasionally, if I’ve made better time that day than expected, it could be closer to 3:30 pm. ~ Once my campsite is set up (I always do that first) I top off my water, wander around and take some photos, and talk to other hikers if I’ve camped near them. (About a third of the time I seek out places where other campers are unlikely to be spending the night.) My only hot meal of the day is usually dinner, and I always eat with a view. ~ Once I’m snug in my tent (if I set up one) I finish entering notes into my hike journal for the day. Then I spend a few minutes familiarizing myself with the next day’s hike. Last, after an entire day in the wilderness, I escape back to civilization for a while by reading. Unlike many, I never select “outdoorsy” books. Give me a good mystery! I understand that this will not be everyone’s cup of tea. What I do hope you take away is this: decide why you are out there on the trail and make sure your hike routine reflects those priorities. Morale is a fragile thing on the trail, particularly if the pack is a bit heavier than you expected, there are a few more ascents than you had really planned for, or you are carrying ten or eleven days of food on your back as you climb out of Muir Trail Ranch. It’s worth any effort to keep your mind right; don’t let a little discomfort mess with your head. Here’s a self-test I like to use when I’m on the trail. 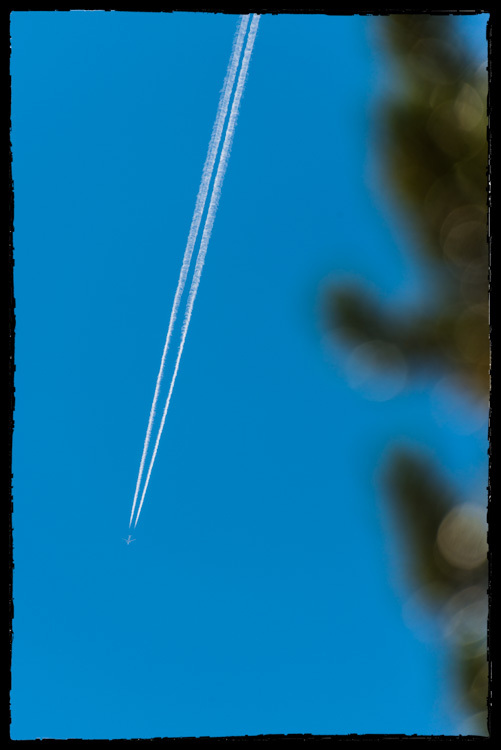 I look up, find an airliner (there ALWAYS seems to be an airliner above you, somewhere, especially at night), and imagine someone sitting in first class with a stiff drink in his or her hand. Now, ask yourself this: would you trade places? ~ Try to reconnect with what drove you to take on the trail in the first place. Remember, as best you can, why you worked as hard as you did to get on the trail. Are you making sure that you are taking the time to enjoy what motivated you in the first place? ~ Have you been eating and drinking sufficiently? Appetites often disappear during a hike, particularly at the beginning if you are not acclimatized. Eating too few calories makes every step difficult. Dehydration can also slow you down, and can even be deadly. ~ Take a long break or stop early for the day. Some extra rest might make all the difference. ~ Fix a special meal. I always make sure I pack something extra delicious so I can splurge. I usually eat that meal the night before I summit, but it is always there in case I need a morale boost on the way. Try some of these and see if you can’t re-kindle some enthusiasm. Then, recommit to finishing. If you do, you will have an experience far more memorable than any first class flight.